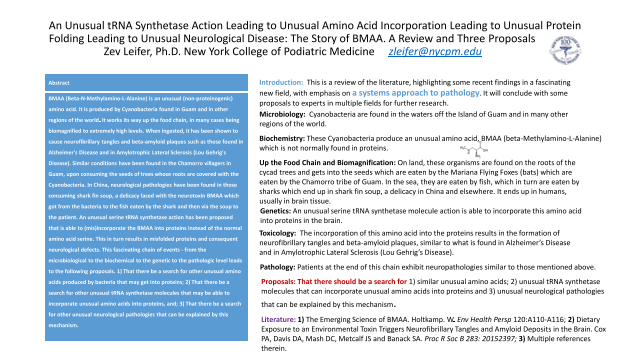 Abstract: BMAA (Beta-N-Methylamino-L-Alanine) is an unusual (non-proteinogenic) amino acid. It is produced by Cyanobacteria found in Guam and in other regions of the world. It works its way up the food chain, in many cases being biomagnified to extremely high levels. When ingested, it has been shown to cause neurofibrillary tangles and beta-amyloid plaques such as those found in Alzheimer's Disease and in AmylotrophicLateral Sclerosis (Lou Gehrig's Disease). Similar conditions have been found in the Chamorro villagers in Guam, upon consuming the seeds of trees whose roots are covered with the Cyanobacteria. In China, neurological pathologies have been found in those consuming shark fin soup, a delicacy laced with the neurotoxin BMAA which got from the bacteria to the fish eaten by the shark and then via the soup to the patient. An unusual serine tRNAsynthetaseaction has been proposed that is able to (mis)incorporate the BMAA into proteins instead of the normal amino acid serine. This in turn results in misfolded proteins and consequent neurological defects. This fascinating chain of events -from the microbiological to the biochemical to the genetic to the pathologic level leads to the following proposals. 1) That there be a search for other unusual amino acids produced by bacteria that may get into proteins; 2) That there be a search for other unusual tRNAsynthetasemolecules that may be able to incorporate unusual amino acids into proteins, and; 3) That there be a search for other unusual neurological pathologies that can be explained by this mechanism.